MSE Professor and Department Head Dr. S. Pamir Alpay was recently elected a Fellow of the American Physical Society (APS) for his work on functional/smart materials. On Friday, November 1, 2013, the UConn School of Engineering hosted its first-ever Industry Open House, which brought to campus more than 150 individuals from across the commercial and industrial spectrum. The event featured an exhibition component as well as one-on-one meetings. Dr. Cato T. Laurencin, a world-renowned physician scientist at the UConn Health Center and member of the Chemical & Biomolecular Engineering faculty, has been elected a Fellow of the American Association for the Advancement of Science. What are UConn Engineering graduates up to? Read about the recent career highlights of alumni like Joseph Daraio, Hatim Sharif, Robert Stadalius and Bernard van Leggelo! To help you in your long-term planning, we are sharing a list of the 25 estate documents you should have in one place. This list will help you map out your long-term plans, ensure your family is cared for, and provide clear guidance on your intentions. Dr. Thomas J. Peters, professor of Computer Science & Engineering, was presented an IBM Faculty Award for 2013-14, which entails a monetary component as well as continued preferred access to IBM researchers and research facilities, including the company’s supercomputers. Dr. Nicholas Lownes was selected to receive one of just nine awards presented in conjunction with the 2013 Provost’s Awards for Excellence in Public Engagement. Dr. Lownes is the F.L. Castleman Associate Professor in Engineering Innovation in the Civil & Environmental Engineering Department and serves as Director of the Center for Transportation and Livable Systems. The UConn Engineering community — from students to faculty and staff — wish you and your loved ones a joyous and healthy holiday season. In celebration of the challenges of exam week, we are happy to share with you this light-hearted video message. Dr. Shengli Zhou was elected a Fellow of the IEEE (the Institute of Electrical and Electronics Engineers) in recognition of his “contributions to wireless and underwater acoustic communications.” Dr. Zhou is co-director, with Dr. Jun-Hong Cui, of the Underwater Sensor Networks Lab at UConn and an expert in underwater acoustic communications and networking, multi-user and multi-carrier communications, space-time coding, adaptive modulation, and cross-layer designs for wireless systems. As the holiday season approaches, we in the UConn School of Engineering wish to express our deep appreciation to all of the people — alumni, students, our UConn community and industry friends — who stand at our side day in and day out, helping us to attain our highest aspirations. On November 19th, UTC and UConn Engineering announced the founding of a new UTC Institute for Advanced Systems Engineering at UConn. But, what is systems engineering, and how will this revolutionary approach change the engineering landscape? This video unveils the promise of systems engineering. The UConn School of Engineering, in partnership with United Technologies Corporation (UTC), launched the UTC Institute for Advanced Systems Engineering at UConn, thanks to $10 million in planned investments from UTC. The initial $7.5 million contribution is one of the largest corporate gifts in UConn’s history and represents a significant investment in educating the next generation of engineering leaders. UConn Engineering students are inventing novel technologies, receiving awards and changing the world around them. Read about some of their latest activities you won’t want to miss. With funding from the Connecticut Department of Transportation, the Connecticut Technology Transfer (T2) Center at the University of Connecticut launched the Connecticut Safety Circuit Rider Program on November 1st. The T2 Center is an educational outreach program within the School of Engineering’s Connecticut Transportation Institute. UConn Magazine — the University’s twice-yearly alumni publication — is now delivering a new kind of experience to readers, with audiovisual storytelling made possible through the magazine’s free app for tablet devices. What are UConn Engineering graduates up to? Read about the recent career highlights of alumni like Lake Barrett, David Giuffrida, Scott Tyler and a dedicated corps of Academy of Distinguished Engineers members who discussed their careers with undergraduate students as members of two panels. What are UConn Engineering graduates up to? Read about the recent career highlights of alumni like John Goehrke, Peter Millett, Hien Nguyen, Stephen Rupar, Ernesto Suarez and Rich Tehrani. Dr. Quing Zhu has received a four-year, $1.43 million grant from the National Institutes of Health in support of her research aimed at predicting the effectiveness of preoperative or neoadjuvant chemotherapy (NAC) used in treating advanced breast cancers. Three Computer Science & Engineering faculty have received a highly competitive Department of Education Graduate Assistance in Areas of National Need (GAANN) three-year award of more than $805,000, which will support fellowships for graduate students pursuing research in “exascale computing.” Dr. Chun-Hsi (Vincent) Huang is the lead investigator on the grant. On September 26th, Dr. Arash E. Zaghi and nearly 30 students enrolled in his graduate-level Bridge Structures class traveled to New Haven for a presentation and tour of the Pearl Harbor Memorial Bridge, commonly called the “Q-Bridge,” which is undergoing a complete replacement under the I-95 New Harbor Crossing Corridor Improvement Program. Graduate student Jaime Angueira recently presented a TEDxUConn lecture, and members of the Material Advantage chapter at UConn toured Laser Joining Technologies. Read about their activities. Biomedical Engineering senior Jonathan T. Kaplan was awarded a prestigious national Science, Mathematics & Research for Transformation (SMART) Scholarship in August. He was one of just 150 recipients chosen from nearly 10,000 applicants, and Jon is UConn’s second student to receive a SMART scholarship. Materials Science & Engineering doctoral student Claire Weiss was a 2009 SMART recipient. We’ve all seen those little messages pop up on our computer screens: “A software update is available from XYZ. Click ‘Update’ to install.” Probably more often than not, we ignore them just as we ignored mother’s good advice to “Be sure to wear a coat to school;’it’s cold outside.” And, just as we shivered in sub-freezing temperatures wearing a t-shirt and jeans at the bus stop, when we ignore the software update messages, we’re likely to experience negative consequences. Professor Ramamurthy Ramprasad, postdoctoral fellow Dr. Ghanshyam Pilania, and doctoral candidate Chenchen Wang of Materials Science and Engineering, in conjunction with Professor Sanguthevar Rajasekaran (Computer Science and Engineering) and Dr. Xun Jiang (Ph.D. Statistics 2013), jointly collaborated on a research paper published online on September 30, 2013 in Scientific Reports, the open access journal of Nature. The Center for Hardware Assurance, Security and Engineering (CHASE) recently awarded funds to six teams to carry out cutting-edge security research. The funding pool was established by industry members of the CHASE Consortium, which seeks to contribute toward solving security challenges that are widespread across many industries. On Thursday, November 14th, from 5-7 p.m., the School of Engineering will host “Real Engineers Shake Hands,” a professional networking seminar and reception. Alumni, friends and UConn Engineering students are invited to participate in this dynamic and exciting event. At UConn, many researchers employ parallel computational techniques to solve problems, and they are reliant upon UConn’s high performance computing (HPC) capabilities to carry out their work. A team of researchers from the School of Engineering and the UConn Health Center has received $1.09 million in NSF funding in support of their research aimed at developing a scalable and universal model for fault detection, diagnosis and prognosis of heating, ventilation and air conditioning, or HVAC, systems in buildings of differing sizes and functionalities. A group of researchers and students from UConn – including computer science students – and Harvard Medical School have developed a new Web program that will help scientists visually analyze DNA and protein sequence patterns faster and more efficiently than ever before. Each summer the School of Engineering and the Engineering Diversity Program host a variety of learning and research experiences for prospective students as well as grade 5-12 teachers aimed at sparking interest in engineering education and careers. Undergraduate students Daniel Violette and Rodney Sutherland received prestigious honors recently, the James A. Willett Educational Memorial Scholarship Award and Presidential Scholar Enrichment Award, respectively. Read about them here. Reconnect with friends old and new, network with professionals from the engineering and business communities and learn of the latest initiatives underway at your alma mater during the October 17th UConn alumni reception in Houston, Texas! If you’ve ever eaten a granola bar or driven a car with tinted windows, then you’ve unknowingly stumbled upon the work of UConn alumnus Ken Chang (M.S. Chemical Engineering, ’85). UConn Engineering is hosting its First Annual Industry Open House on Friday, November 1, 2013 to let industry in on the “Quiet Corner’s” best kept secret. For details and to register, please visit the event website. Do you know an exceptional UConn engineering alumnus or alumna, or an indispensable School of Engineering friend who deserves special recognition? Please nominate your candidate for UConn’s Academy of Distinguished Engineers. Winter Weekend and its famous – or infamous – “one ton sundae” have been a UConn tradition for more than a generation. During Winter Weekend, students, faculty and staff unwind with a variety of fun activities gauged to chase away the winter blues and connect with friends. How influential is any one faculty member in helping to shape the next generation of engineering leaders? In the case of Dr. Donald Potter, professor emeritus of Metallurgy and Materials Science, the answer was resoundingly clear when a tightly knit group of former graduate students returned to Storrs over the summer for a reunion with their beloved graduate school advisor and mentor. What are UConn Engineering graduates up to? Read about the recent career highlights of alumni like William Foley, Lon Hultgren, Donna Rizzo and Brian Quillia. With the objective of gaining insight into the role of specific genes on bone health, a multidisciplinary team of researchers from UConn Engineering, the UConn Health Center and colleagues at the Jackson Laboratory have received a new five-year, $3.2 million grant from the National Institutes of Health’s National Institute of Arthritis and Musculoskeletal and Skin Diseases. A bioengineered matrix for treatment of torn anterior cruciate ligaments invented by a UConn Health Center physician-scientist Dr. Cato T. Laurencin is now patented in the United States. NASA astronaut and UConn alumnus Rick Mastracchio ’82 (ENG) is making his fourth trip to the International Space Station in a few weeks. While the destination may be a familiar one, this mission marks the first time Mastracchio is flying aboard a Russian Soyuz spacecraft to get there. UConn Engineering has launched a new Senior Design website to serve as a resource and guide for companies that are interested in sponsoring senior design projects in any one of our programmatic units. What are UConn Engineering graduates up to? Read about the recent career highlights of alumni like Ronald Goldblatt, Tom Martin, Pierre Dufilie, Clement Valerio and Chulwoo Park. Great things are always underway in the School of Engineering. Read about Engineering Advisory Board member Paul Adams, a Dominion Resources’ grant in support of a Grass Tech green energy project, and a visit by three distinguished researchers from Turkish universities. Dr. Pu-Xian Gao, associate professor in the Department of Materials Science & Engineering and the Institute of Materials Science, has been awarded an Alexander von Humboldt Research Fellowship. UTC and UConn Engineering held a day-long workshop in late June to discuss how experts from industry and academia can come together to develop new engineering techniques that will make it easier to successfully build products and services that combine complex software, hardware and mechanical components. Interim Dean of Engineering Kazem Kazerounian has named Dr. Rainer Hebert as Director of the recently established Pratt & Whitney Additive Manufacturing Innovation Center (AMIC) at UConn. Dr. Hebert brings not only strong leadership skills to his new role but also expertise in additive manufacturing alloy development and process capabilities. Mark your calendars to attend UConn Engineering’s First Annual Industry Open House on Friday, November 1, 2013. The half-day event will feature an informal networking forum, during which visitors will have the opportunity to speak with more than 60 engineering faculty members and to view posters highlighting commercially promising research underway at UConn. What are UConn Engineering graduates up to? Read about the recent career highlights of alumni like Dennis Bushnell, Richard Mastracchio, Trent Molter, Morton Pearson and Jeffery Rotman! A group of researchers in UConn’s departments of Geography and Civil & Environmental Engineering have developed and tested a new index that will measure the sustainability of complex urban transportation systems across the globe. The index will allow policymakers, scientists and the public to understand not just how congested cities’ transportation systems are, but the economic, social, and environmental impacts of the system as a whole. Across his long and storied career, alumnus Gordon Cooper played a leading role in helping major manufacturers grow their global operations. Among his career highlights was his contributions toward expanding the iconic Mickey Mouse watch line first introduced in 1933. Dr. Bing Wang is leading a major educational effort in the Global Environment for Network Innovations (GENI) project, a virtual laboratory for at-scale networking experimentation where the highest minds unite to envision and create new possibilities for future internets. The goal of the project is to understand and use the GENI infrastructure for networking research and education through workshops, summer camps, and course curriculums. UConn Engineering hosted five National Science Foundation-funded Research Experiences for Undergraduates sites during the summer that enabled 43 undergraduates from across the nation to explore exciting research in engineering faculty laboratories. Among the REU programs was one that immerses students in both the research and entrepreneurial environments: Promoting Innovation and Entrepreneurship through Academic-Industrial Partnerships. Dr. Pu-Xian Gao, an associate professor of Materials Science & Engineering, has received a $300,000 grant from the Department of Energy’s University Coal Research program in support of the research efforts to design and fabricate high temperature sensors based on the 3D nanowire assemblies. The University has received $2.14 million in state funding to create an independent microgrid energy system at its Depot Campus in Storrs. UConn’s microgrid will be supported by an existing 400kW fuel cell and a demonstration-scale 6.6 kW photovoltaic solar panel array located adjacent to the Center for Clean Energy Engineering. The microgrid is expected to be operational by June 2014. Drs. 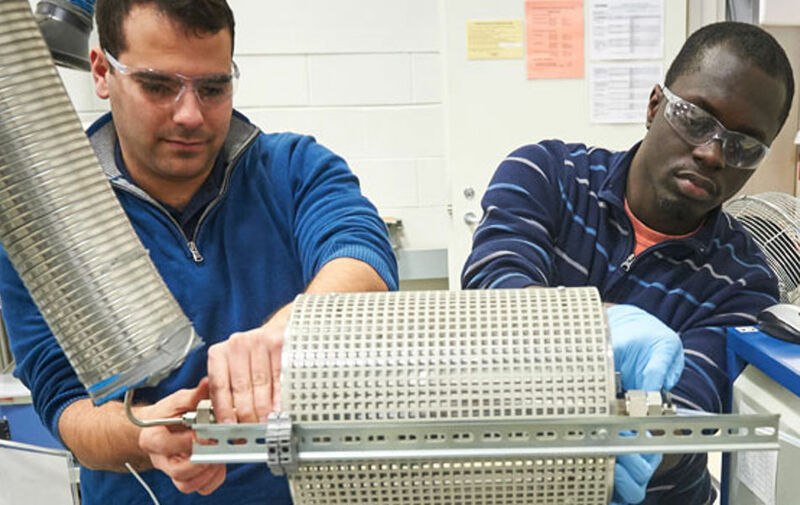 Maurice Gell and Eric Jordan have developed a new process for making ceramic thermal barrier coatings (TBCs) that are used extensively in gas turbine engines. This Solution Precursor Plasma Spray (SPPS) process allows the deposition of higher temperature, lower thermal conductivity TBCs that will provide significant fuel savings for aircraft and land-based gas turbines. The Connecticut-based engineering firm of Milone & MacBroom, Inc. has created a civil engineering scholarship at UConn to help the next generation of engineers succeed. The firm has connections to the University going back more than three decades. Jeanine Armstrong Gouin ’87, vice president and managing director, has served on the School of Civil & Environmental Engineering advisory board for almost two decades. What are UConn Engineering graduates up to? Read about the recent career highlights of alumni like Michael Cantor, Thomas Gaal, Carl Lawton, Louis Parrillo and Paul Scheihing! On June 19, 2013, over 40 participants attended a Manufacturers Roundtable meeting at the UConn-Greater Hartford Campus to learn how universities collaborate with Connecticut-based industry to work on advanced technology projects. From Igor Sikorsky’s first American helicopter to Pratt & Whitney’s latest engine for the nation’s new Joint Strike Fighter jet, Connecticut has a proud history of aviation science innovation. At UConn, researchers are doing their part by supplying Connecticut’s robust aerospace industry with innovative technologies to support a new generation of faster, more efficient, and more reliable aircraft demanded by commercial airlines and the U.S. military. Each year, all senior engineering students engage in capstone design courses. These provide hands-on learning opportunities and expose them to the challenges and satisfactions of solving real-world dilemmas, from the problem definition stage to prototype development. In the case of sponsored projects, teams work closely with the sponsoring company, which provides financial support, advising and the design challenge. In the spring, the School of Engineering honored six faculty members for their dedication to exceptional graduate student advising, and to the supportive mentoring of junior faculty members by presenting them Outstanding Faculty Advisor Awards and Outstanding Faculty Mentoring Awards. The Fraunhofer Center for Energy Innovation at UConn, a partnership between UConn, Fraunhofer USA, and the Connecticut Department of Energy and Environmental Protection, was officially launched by Gov. Dannel P. Malloy on July 25, 2013 at the University’s Depot Campus. With the aim of answering the question “What do engineers do?” a group of 50 high school sophomores from the Academy of Aerospace and Engineering and Greater Hartford Academy of Math and Science visited UConn on May 3 to explore UConn’s Senior Design Demonstration Day. New UConn graduate Brian Coleman ’13 (ENG) recently completed a major accomplishment. And not just by graduating as an Honors Scholar with a strong GPA in the demanding biomedical engineering program. His senior design project – a robotic arm – so impressed director of undergraduate biomedical engineering Donald Peterson that he is arranging for Coleman to present it to a team of NASA engineers at the Lyndon B. Johnson Space Center in Houston. Nine motivated student innovators will discuss their industry-sponsored research on Thursday, July 25 as featured guests at this month’s Innovation Connection networking event, to be held at Nerac starting at 3:30 PM. The students are participating in a National Science Foundation-sponsored summer program, called Research Experience for Undergraduates, at UConn that promotes innovation and entrepreneurship through partnerships with commercial companies. Dr. Jeffrey McCutcheon is intent on bringing science, engineering and technology to a broader audience where preconceptions can be discussed openly and overturned. To that end, in April he launched a weekly, two-hour talk radio program on UConn’s noncommercial college and community radio station, WHUS, called Science Friction. The Engineering Ambassadors are the highly visible student representatives of UConn’s School of Engineering. This year, in honor of National Engineers Week, they hosted a series of hands-on demonstrations around campus to illustrate engineering in action. Dr. William Mustain is the recipient of a U.S. Department of Energy Office of Science Early Career Award, which is one of the most competitive in the United States, with only 65 awarded annually. Dr. Mustain’s five-year, $800,000 award was presented by the Office of Basic Energy Science. Generous scholarships enable hundreds of UConn Engineering students every year to gain a world-class education that might otherwise be unaffordable. Meet a few of our scholarship recipients in this video. What are UConn Engineering graduates up to? Read about the recent career highlights of alumni like Mike Curtis, Joel Douglas, Andrew Gere, Michael McGinnis and Xingjian (Chris) Xue! Don’t miss out on today’s Innovation Connection networking event, which takes place at UConn’s Avery Point campus and features a discussion on “Smart Ocean Technology” followed by a cocktail reception. What are UConn Engineering graduates up to? Read about the recent career highlights of alumni like Joshua Aferzon, Richard J. Colangelo, Jr., Michael Georgiopoulos, Margo Martin, Brian Timm and James Towey. 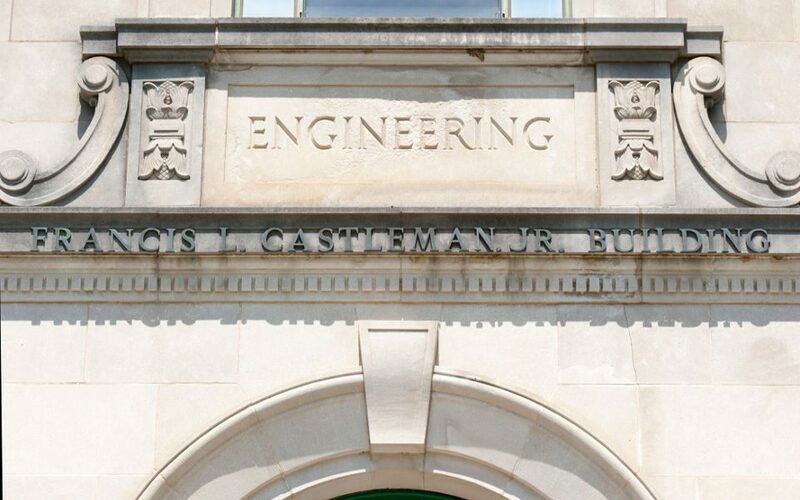 Following an especially ambitious recruiting year, the School of Engineering is excited to announce that 22 impressive new faculty members will join us for the fall 2013 and spring 2014 academic terms. It is the largest number of new hires in the history of UConn Engineering and reflects the dramatic growth in enrollments underpinned by UConn’s commitment to ensuring critical mass for strategic growth areas. Dr. Robert X. Gao, the Pratt & Whitney Chair Professor (Mechanical Engineering), and colleagues have received a three-year National Science Foundation GOALI grant to support collaborative research aimed at improving spare parts inventory management in the aircraft industry. Dr. George Bollas, an assistant professor in the Department of Chemical & Biomolecular Engineering, is the recipient of a prestigious American Chemical Society Petroleum Research Fund Doctoral New Investigator Award. In late April, seven enthusiastic undergraduate students, accompanied by John Bau, a Career Consultant embedded within the School of Engineering, enjoyed a rare opportunity to tour the Dominion Millstone Power Station, located in Waterford, CT, which is the largest electricity generation plant in New England. Assistant professor Jeffrey McCutcheon was selected a 2013 DuPont Young Professor. He is one of just 14 young professors, representing seven countries, to receive one of the three-year awards this year. The award will fund his ongoing research in the area of novel membranes for use in water filtration and energy storage. Read about the exciting array of events planned in conjunction with Alumni Weekend (June 7-8), as well as recent career highlights of alumni like Keith Berger, Frederick Carlson, Michael Keefe and Edward J. Sarisley, Jr.
Materials Science & Engineering professor Dr. Radenka Maric, in close collaboration with Industrial Advisory Board member Armand Halter and Dr. William Mustain, has received a prestigious $423,000 National Science Foundation GOALI award. Eight engineering students won highly competitive Summer Undergraduate Research Fund Awards that will allow them to conduct scholarly research in faculty laboratories this summer. A total of 70 SURF grants were awarded by the Office of Undergraduate Research, across the entire university. Two graduate-level researchers in the School of Engineering have grown some of the world’s smallest metallic nanorods; a significant scientific breakthrough that their faculty advisor, Dr. Hanchen Huang, says is a testament to UConn’s robust graduate education programs. On May 4, more than 600 young inventors converged on Gampel Pavilion, the home of UConn’s eight-time NCAA women’s basketball team, for the 30th annual state-wide Connecticut Invention Convention hosted by UConn’s School of Engineering. On May 4th, the School of Engineering honored the achievements of nearly 500 undergraduate students and 200 graduate students who were awarded their BS, MS and Ph.D. degrees after years of long nights, countless problem sets, design challenges and joyous “aha” moments when difficult formulas suddenly gain meaning. The events were celebrated before a packed audience of families, friends, faculty and officials assembled to cheer on the graduating engineers. Three faculty members were inducted into the Connecticut Academy of Science and Engineering on May 22 during a gala event: Drs. Thomas Barber, Wilson K. S. Chiu and Mei Wei are among 33 new members who were elected in the 2013 class. In addition, alumnus Dr. Anthony DeMaria received the 2013 CASE Distinguished Service Award for his enduring contributions to the Academy as a charter member, fourth president and past-president. During a gala event on May 2, the School of Engineering honored 10 exceptional alumni and friends as 2013 inductees into the UConn Academy of Distinguished Engineers. Nearly 100 attendees helped to honor the new inductees, each of whom spoke of the profound influence of UConn Engineering in shaping their careers. Share your photos from your years in the UConn School of Engineering. We’re assembling an online photo album showing scenes from laboratories, classrooms, dorms and campus activities that reflect UConn Engineering across the decades! Here, alumna Sharon Nunes shares a few of her faves. At UConn, faculty and students are exploring transportation engineering challenges through the Center for Transportation and Livable Systems (CTLS). They are exploring driver behavior, roadway construction and design, the intersect between highways and communities, and a myriad of other topics. Proving once again that UConn’s women engineers are not merely gifted academically but also dedicated to advancing and supporting their peers, the UConn chapter of the Society of Women Engineers hosted the annual Region F conference at the Storrs campus the weekend of April 6-7. UConn Engineering students are outstanding: academically excellent, engaged and accomplished. Read about some of their latest news, awards and honors. The University of Connecticut and Pratt & Whitney celebrated the opening of a new Pratt & Whitney Additive Manufacturing Innovation Center at UConn, one of the most advanced additive manufacturing laboratories in the nation. Tucked away in Connecticut’s Quiet Corner is a company that has been serving the world’s leading aerospace companies for decades, Whitcraft, LLC. Among its valued employees are four UConn Engineering alumni, including Chad Chmura, a Junior Engineer who received his B.S. in Mechanical Engineering in 2012. UConn Engineering was well represented during the Second Annual Celebration of Innovation, presented by the UConn Office of Economic Development on April 10th. The gala event afforded the innovation community an opportunity to network and to celebrate the achievements of some of its most outstanding members. Ph.D. candidate Michael Zuba was awarded a fellowship to continue his underwater network systems research in Taiwan for eight weeks this summer. He will be hosted by Dr. Tshi C. Yang, an expert in the underwater acoustics field, at National Sun Yat-sen University. What are your UConn Engineering friends up to these days? Read what’s new in the careers of Michael Anderson and John Krenicki, Jr. Then share your career news with us, too! On April 11th, a dedicated team of students and faculty demonstrated and discussed innovative “home grown” engineering prototypes at the Connecticut State Capitol during a rally in support of Governor Dannel P. Malloy’s proposed Next Generation Connecticut. Interim Dean Kazem Kazerounian announced three new appointments in the School of Engineering leadership: Dr. Mei Wei has been named Associate Dean for Research & Graduate Education; Dr. Michael Accorsi will assume the role of Senior Associate Dean; and Dr. Daniel Burkey will assume the role of Associate Dean for Undergraduate Education and Diversity. Aircraft manufacturer Airbus has donated an aircraft flap assembly worth more than $774,000 to the University of Connecticut’s School of Engineering for use in its research laboratories and training classes. Ph.D. candidates Neil Spinner and Ying Liu have received John Tanaka Graduate Student Fellowship awards, which are presented to outstanding UConn graduate students who are members of Phi Kappa Phi, the nation’s oldest honor society. The award was first given in 1993. It was established in honor of Dr. John Tanaka, emeritus professor of chemistry and former Director of the Honors Programs. Dr. C. Barry Carter, professor of Materials Science & Engineering, will receive the Microscopy Society of America’s 2013 Distinguished Scientist Award for the Physical Sciences in recognition of his internationally acclaimed research and distinguished contributions in the field of microscopy. Doctoral candidates Lu Han and Paul Elliott have been competitively selected to represent UConn Engineering at the Universitas 21 Graduate Research Conference on Energy Systems, Policy and Solutions at University College Dublin, Ireland from June 19 – 22, 2013. Universitas 21 is an international network of 23 leading research-intensive universities, including UConn, located in 15 countries. UConn Engineering was well represented during the 2013 Women of Innovation Awards night on March 19th, with six outstanding women finalists among a total of 52 finalists spread across nine categories. Doctoral candidate Zhaohui Wang took home the Collegian Innovation and Leadership Award for her exceptional achievements in the area of underwater acoustic communications and networking. Under the leadership of CSE professor Ion Mandoiu, the University of Connecticut Programming Team won the recent Association for Computing Machinery (ACM) local and regional contests and is heading to St. Petersburg, Russia in June to compete in the 37th ACM International Collegiate Programming Contest (ICPC) World Finals! Since September, Donna Aranibar, a Glastonbury High School senior, has been traveling to UConn twice weekly to participate in research underway in the laboratory of Dr. George Bollas, assistant professor of Chemical & Biomolecular Engineering. Initially uncertain of her college aspirations and commitment, today Monica Smith – a double major in German and Mechanical Engineering – is the picture of a successful engineer-to-be. After graduating from high school in 2007, Monica took part in the ACES program at UConn for her freshman year. Materials Science & Engineering (MSE) doctoral candidate Jialan Zhang was recently awarded the Best Oral Paper Prize at the 22nd Connecticut Microelectronics and Optoelectronics Consortium. On Thursday, March 21, the Innovation Connection will move to the UConn Health Center, where attendees will hear details of the unfolding UConn-Jackson Laboratory collaboration (Jackson Laboratory for Genomic Medicine) along with information about UConn’s Technology Incubation Program. Dr. Marisa Chrysochoou has been awarded a prestigious Marie Curie International Incoming Fellowship that will embed her at the National Technical University of Athens for two years, where she will share her expertise on chromium contamination and specialized experimental techniques with an interdisciplinary team of colleagues who are investigating a large chromium plume in central Greece. Junior Michael Johnson is the archetype of a busy engineering student, parsing his time among academic, leadership and social commitments while pursuing dual degrees in Civil Engineering and Environmental Engineering. Dr. Emmanouil Anagnostou, an internationally renowned expert in the area of hydrometeorology and precipitation remote sensing, was recently awarded a $360,000 grant from NASA to advance his research aimed at improving the use of satellite-derived rainfall data in hydrologic modeling of complex terrain basin floods. On Saturday, March 9th, more than 500 students and coaches from across the Northeast region competed in the Northeast Regional High School Science Bowl at the UConn campus. A total of 48 teams representing 36 schools matched wits in a Jeopardy!-style quiz bowl covering a dizzying array of scientific minutia along with a model fuel cell car race. In February, UConn’s Engineering Ambassadors hosted eight high school teams from across Connecticut in a unique Rube Goldberg Machine Contest named after the late cartoonist Reuben Lucius Goldberg, who gained fame for his wacky illustrations of machines, designed in the most convoluted ways possible and intended to carry out simple tasks. It was a traumatic accident his junior year of high school that inspired Adam Eichen to pursue a career in biomedical engineering. Today, the talented sophomore’s drive and determination to earn an advanced degree in his field have secured him a spot among the ranks of the newly established UConn McNair Scholars. On March 5th, Professor of Practice Dr. Hadi Bozorgmanesh and 10 students enrolled in the two-semester Experiential Technology Entrepreneurship I and II class spent the day meeting with Connecticut Senator Donald Williams and Rep. Gregg Haddad, touring the legislative houses, and observing committee hearings on a variety of subjects. Read more about the Entrepreneurship class here. Glastonbury, CT native Milos Atz, a junior studying Chemical Engineering at UConn, shows us inside his life as an undergraduate engineering student, from academic matters and his Honors research to career aspirations and his passion for freeskiing. The School of Engineering will celebrate undergraduate commencement on Saturday, May 11, 2013 in Gampel Pavilion, Storrs. A highlight will be guest speaker, Betty Shanahan, Executive Director and CEO of the national Society of Women Engineers (SWE). An interdisciplinary team of researchers from UConn and three partnering universities is developing a suite of open underwater network testbeds that will be demonstrated along the U.S. East, West and Gulf Coasts, where water quality data will be continuously collected and transmitted to on-shore labs. A multidisciplinary, multi-university project aimed at building a skilled workforce and educational capacity within Ethiopia’s universities in the area of sustainable water resource management has received over $1.35 million in additional funding from the U.S. Agency for International Development/Higher Education for Development to continue its work. Since its official inception in 2010, the project has received nearly $2.5 million in USAID-HED funding. Exciting developments are always percolating within UConn Engineering. Read a few of the highlights here, from student awards and activities to alumni celebrations. A novel fabrication technique developed by UConn engineering professor Brian Willis could provide the breakthrough technology scientists have been looking for to vastly improve today’s solar energy systems. On February 19th, in celebration of National Engineers Week, more than 60 employers and hundreds of UConn engineering students filled the Rome Commons Ballroom at the Storrs campus for the opportunity to meet, discuss career and internship opportunities and do their best to impress. The 2013 spring career fair was widely praised by employers and students alike for its organization and excellent attendance. In late January, the School of Engineering welcomed John Bau, who joined UConn’s Department of Career Services as a Career Consultant embedded within the School of Engineering. What are your UConn Engineering friends up to these days? Read what’s new in the careers of Arthur Baker, William Borghard and William Johnson. Then share your career news with us, too! On January 31, Connecticut Gov. Dannel P. Malloy, UConn President Susan Herbst, and other officials unveiled plan to invest $1.5 billion in UConn’s science, technology engineering and mathematics (STEM) educational programs over a decade. Dubbed Next Generation Connecticut, the plan will greatly expand educational opportunities, research, and innovation in the STEM disciplines through growth in student enrollment, faculty and facilities. The School of Engineering is proud to announce the formation of a new unit called, Continuing and Distance Engineering Education (CDEE). This unit will be responsible for the existing Master of Engineering program, which is currently offered in Groton, East Hartford, Windsor Locks and Farmington, and for continuing engineering education activities and programs at UConn’s regional campuses and corporate partners’ sites. An interdisciplinary team of students has proposed an innovative solution to the problem of stormwater runoff from UConn’s South Campus dormitory complex in response to a U.S. Environmental Protection Agency student competition, the Campus RainWorks Challenge. Business startups emerging from UConn’s technology-fertile, highly inventive community have an important yet little-known ally located just minutes from campus: XcellR8. Assistant Professor Anson Ma has received a National Science Foundation Early Career Development (CAREER) award, which will support his research involving the use of carbon nanotubes to stabilize emulsions. The $400,000, five-year grant is the 26th CAREER Award among current UConn engineering faculty. What are your UConn Engineering friends up to these days? Read what’s new in the careers of Jackie Garofano, Marshall Greenspan, Metin Ozen and Benjamin Salsburg. Then share your career news with us, too! UConn’s rapidly expanding power and energy research division received a boost recently with the hiring of Ali Bazzi, an expert engineer in advanced power electronics who comes to the University after a brief stint with the Delphi Corp., a global leader in electronic systems technologies. On Thursday, February 21, the Innovation Connection series will return to the UConn Storrs campus for an exclusive event. UConn researchers from the Chemical & Biomolecular Engineering Department will discuss commercialization opportunities and their advancements in areas such as sustainable technologies, bio/nanosensing, materials characterization, filtration, biotech, polymer science and more. The UConn School of Engineering is growing, expanding, moving in new directions and building new energy for the future. With this idea in mind, we are reframing and renaming our electronic and print news to Momentum, to better reflect who we are at this time. Assistant Research Professor Dr. Ioulia Valla has been awarded a $190,000 grant from the Energy for Sustainability Division of the National Science Foundation (NSF) for research aimed at transforming waste tar compounds into valuable gases using a one-step catalytic process. Interim Dean Kazem Kazerounian announced three new appointments in the School of Engineering: Dr. Dan Burkey will assume the role of Associate Dean for Undergraduate Education & Diversity effective July 1; Dr. S. Pamir Alpay has been appointed Head of the new Materials Science & Engineering Department; and Dr. Doug Cooper has been appointed Head of the Chemical & Biomolecular Engineering Department. Some of the nation’s top experts in computer hardware security gathered in Storrs last week to discuss new ways to thwart a growing international counterfeit electronics industry. In a series of workshops on Jan. 28 and 29, engineers from Intel, Texas Instruments, Analog Devices, Honeywell, the Missile Defense Agency (MDA), and Connecticut-based SMT Corp., as well as other entities, discussed new tools for improving detection in the increasingly advanced – and profitable – world of counterfeit electronics. “My philosophy is that entrepreneurship needs to be discovered, not taught,” remarks alumnus and Professor of Practice Dr. Hadi Bozorgmanesh, who debuted a new, results-oriented two-semester course last fall, Experiential Technology Entrepreneurship I and II. A total of 10 companies are expected to emerge from the Experiential Technology Entrepreneurship I and II course. Four were launched in December, and six remain in the development stage. In news from the MSE Department, Ghanshyam Pilania was presented the 2012 Outstanding Graduate Student Award, and members of the UConn Materials Advantage student chapter (UCMA) visited Bacon Academy high school to educate and inform integrated science students about materials science and engineering. The School of Engineering welcomes Teresa Barber-Tournaud, who joined the Center for Clean Energy Engineering (C2E2) at UConn as Program Director in December 2012. Ms. Barber-Tournaud comes to UConn with 20 years’ experience at UTC, where she held positions of increasing responsibility with Pratt & Whitney Aircraft, Hamilton Sundstrand (now UTC Aerospace Systems), UTC Research Center, UTC Industrial Lasers and the International Aero Engines consortium under Pratt & Whitney. What are your UConn Engineering friends up to these days? Read what’s new in the careers of John Bean, Charles Croce, Rohan Freeman and James Towey. Then share your career news with us, too! Innovators, mark your calendars for the first Innovation Connection networking event of 2013. On Thursday, January 24, Central Connecticut State University will host entrepreneurs and innovators from across the region for networking, thoughtful discussions and a glimpse inside ideas for transforming classroom ideas into commercially viable businesses. Don’t miss this exciting event! M.S. student Alicia Echevarria (Civil Engineering) secured two awards in the 2012-2013 Connecticut Collegiate Business Model Competition held in December: Best Written Executive Summary and Best Venture Business Plan. Her entrepreneurial entry centered on Advanced Column Solutions, LLC (ACS), a company newly founded by Echevarria and her thesis advisor, Dr. Arash Zaghi. Qian Wang, a Ph.D. student in the laboratory of Dr. Wei Sun, received a American Heart Association fellowship, joining three fellow students – Thuy Pham, Eric Sirois and Caitlin Martin – to win a prestigious, highly competitive national pre-doctoral fellowship.